Inspires you to eat healthy and tasty! 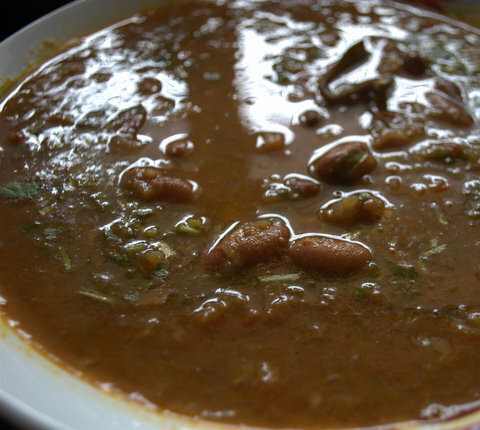 Rajma chawal has always been a classic and a favorite in many households.Kidney beans can sometimes be a difficult task to get the right softness without overcooking them. Here are some handy tips to help us cook kidney beans to perfection. The first method is to boil the beans for two minutes, take pan off the heat, cover and allow to stand for two hours. The alternative method is to simply soak the beans in water for eight hours or overnight, placing the pan in the refrigerator, so the beans will not ferment. Before cooking the beans, regardless of pre-soaking method, drain the soaking liquid and rinse the beans with clean water. To cook the beans, you can either cook them on the stovetop or use a pressure cooker. For the stovetop method, add three cups of fresh water or broth for each cup of dried beans. The liquid should be about one to two inches above the top of the beans. Bring the beans to a boil and then reduce to a simmer, partially covering the pot. If any foam develops, simply skim it off during the simmering process. 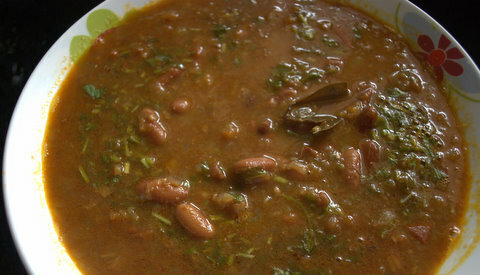 Kidney beans generally take about one and one-half hours to become tender using this method. They can also be cooked in a pressure cooker where they take about one-half hour to prepare. Regardless of cooking method, do not add any seasonings that are salty or acidic until after the beans have been cooked. Adding them earlier will make the beans tough and greatly increase the cooking time. Take some oil in a pan and add jeera, bay leaf, cloves and cinnamon. Once done add onions and cook till it turns transparent. Add chopped tomatoes and ginger garlic paste. Add all the powdered massala, some water and allow it to cook for sometime (about 5 mins). Add boiled rajma and salt to taste. Bring it to boil and simmer the stove. Let it cook for 20 mins and garnish with chopped cilantro. Serve hot with steamed rice or tortillas. 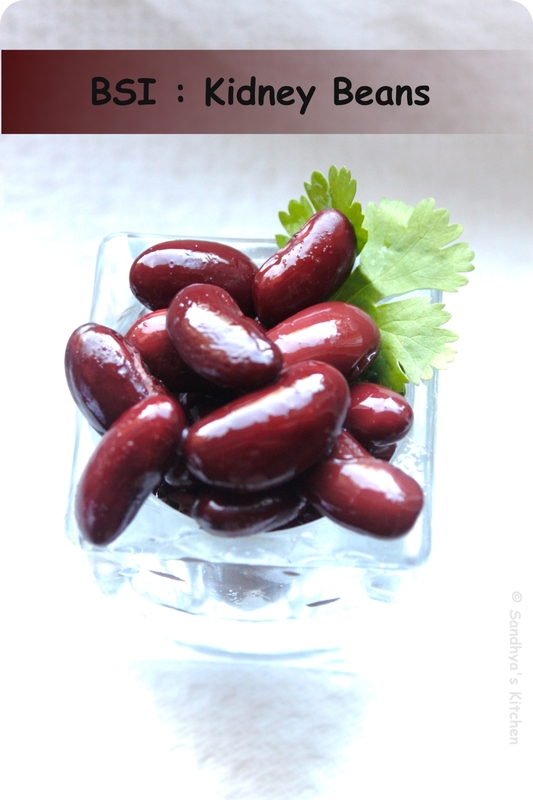 This is my submission to this week’s BSI:Kidney Beans, hosted by Sandhya’s Kitchen. Moroccan salads play a big role in Moroccan cuisine, and most families serve them almost daily. Garden-fresh vegetables might be peeled and chopped before being tossed with a vinaigrette, or they might be cooked with spices and olive oil to make dip-like salads. Most salads can be refrigerated for 2-3 days. Choose beets of uniform size to promote even cooking. To retain nutrients and color, boil, bake or steam without peeling first. The skin will easily rub off under cold running water after they are cooked. When trimming, leave at least an inch of the leaf stems attached and do not remove the root. The stem and root are removed after cooking. If you must peel before cooking, a swivel vegetable peeler works better than a paring knife. To avoid staining your fingers, wear rubber gloves when handling beets. 1 Tablespoon of vinegar added to beet cooking water will not only reduce the odor of the cooking beets, but also help them retain their bright color. For older beets, try adding a pinch each of sugar and salt to each cup of cooking water to revive sweetness and color. Beets are naturally high in sodium, so no salt is necessary in the cooking water. To microwave whole beets, pierce the skin and place one pound in a micro-proof dish with 2 Tablespoons of water. Cook on high for 9 to 12 minutes. Let rest for 5 minutes before cooling and peeling. 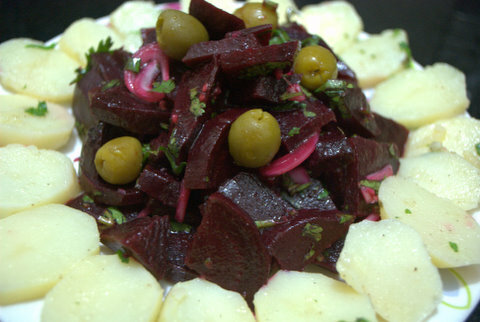 To avoid bleeding of color into other ingredients, add beets just before serving if possible. When cooked, drain off the hot water and fill the pot with cold tap water. Do this a couple of times, until the beets are cool enough to handle. Now take each beet in your hands and just slide the skin right off with your fingers. How easy!!! Mix together the dressing ingredients. 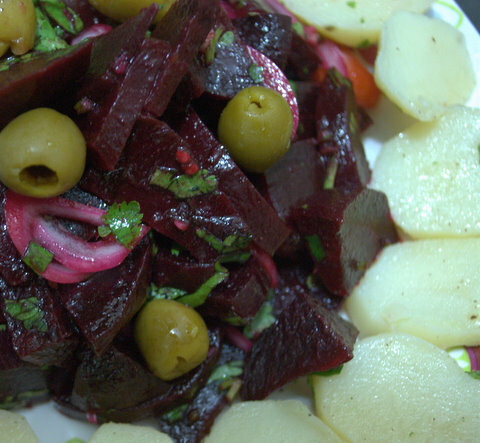 Combine beets in a salad bowl with the onion, tomato, garlic cilantro & parsley.Pour over half the dressing, toss gently. 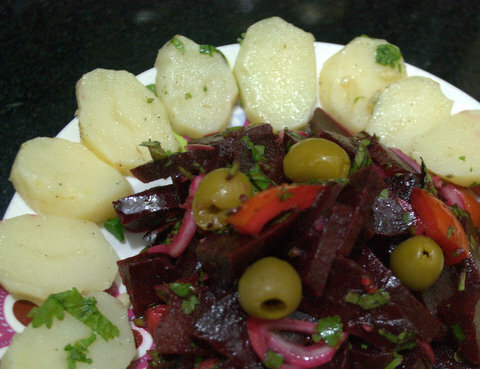 Place the sliced potatoes in a shallow bowl & toss with remaining dressing.Chill both beet and potato salad for 30 minutes. When ready to assemble, arrange beets, tomato & onion in the center of a shallow bowl & arrange potatoes in a ring around them. Serve cold garnished with olives. This is my submission to this month’s destination Morocco hosted by My Kitchen, My World, Vegetarian Foodie Fridays hosted by Breastfeeding Moms Unite!, Healing Foods – Beet, hosted by Mharo Rajasthan’s Recipes & Siri’s Corner, Low Oil/Low Calorie hosted by Mharo Rajasthan Recipes & Foodelicious, Dish name starts with ‘B’ by Learning-to-cook, and finally to this week’s Souper Sundays hosted by Kahakai Kitchen. Hubby: you will just season it with some grated coconut and I don’t like coconut…. Soak the rice for an hour. Take butter in a pan and saute bay leaf,onions, cashews, cardamon and garlic until onions are soft.Add rice, salt and turmeric powder. Mix the ingredients well by adding coconut milk and cover the lid. Let the rice cook on low flame for about 20 minutes (or pressure cook). 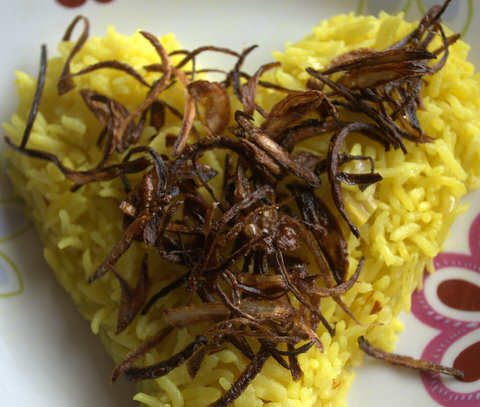 Garnish with fried onions and serve hot with any curry. 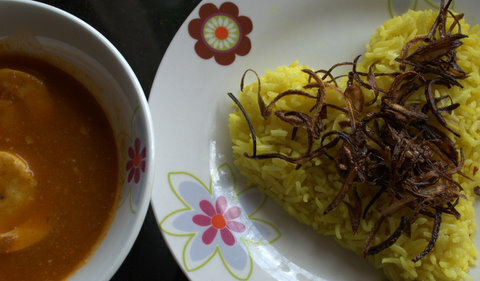 I had to prepare this dish to give hubby a real taste of what I meant by coconut rice……. This is my submission to this month’s Festive rice event, hosted by Torview. Taste & Create is a monthly event where blogger are paired with each other and have to create one of their recipes. It was time for me to explore new blog for a different taste….. I don’t like elaborate cooking and found the above easy and quick to cook. The selection was spot on and it turned out to be an absolutely satisfying meal. The flavor was just perfect and very different in comparison to spring onions and garlic that are most commonly used in Indian-Chinese cuisine…. Rinse chicken; pat dry. Cut into ½-inch pieces. For sauce, stir together the broth, cornstarch, soy sauce, molasses, and ginger; set aside. Heat oil in a wok or large skillet over medium-high heat. (Add more oil as necessary during cooking.) Stir-fry the celery and onion in hot oil for 2 minutes. 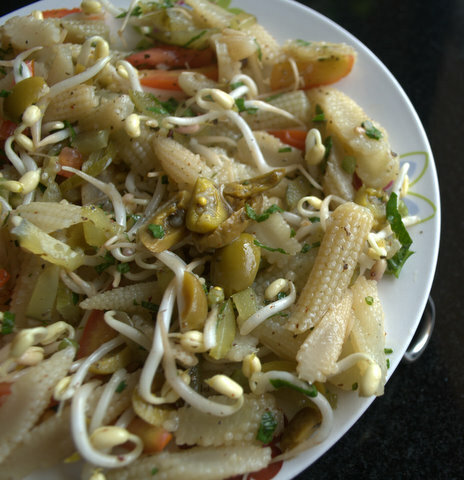 Add fresh bean sprouts, if using, and stir-fry for 1 to 2 minutes more or till celery and onion are crisp-tender. Remove vegetables from wok or skillet. Add half the chicken to the hot wok. Stir-fry for 3 to 4 minutes or till no longer pink. Remove chicken from wok. Repeat with remaining chicken. 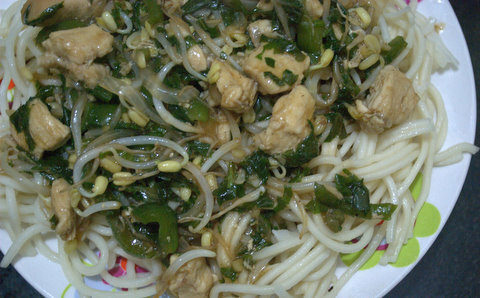 Return all chicken and cooked vegetables to the wok; push from the center of the wok. Stir sauce; add to the center of wok. Cook and stir till thickened and bubbly. 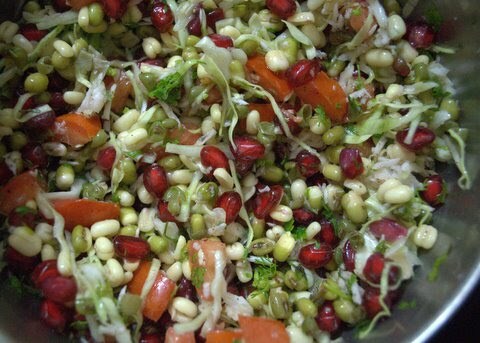 Add canned bean sprouts, if using. Stir to coat with sauce. Cook and stir about 1 minute more or till heated through. 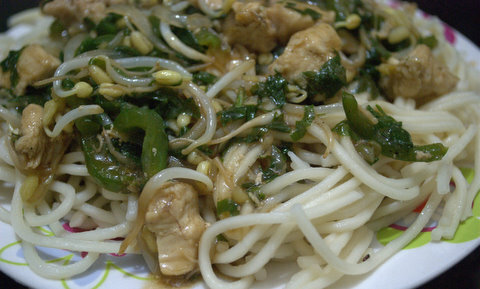 Serve immediately over noodles or steamed rice. A must try and will surely make it again. Hope you’re having a great weekend. So here I am with another one…. You can either cook or serve the corn raw (I prefer it cooked). 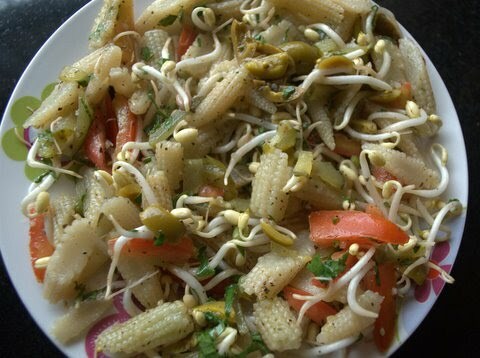 Baby corn, unless overcooked will retain its crunchy texture, especially since you eat the whole corn including the core. On its own, baby corn can have a slightly sweet flavor.It retains the flavors of sauces applied to it and adds interesting texture and visual appeal to a dish. Toss all the ingredients in a bowl and serve cold. This is my submission to this month’s No Croutons Required, hosted by Lisa’s Kitchen and Tinned Tomatoes and this week’s Souper Sundays, hosted by Kahakai Kitchen. 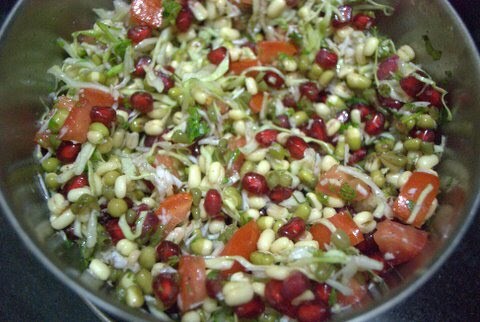 Pomegranate adds a little sweetness to the salad. Its great flavor and health benefits have made it a great candidate for those who seek natural health foods. Look for pomegranates that feels heavy for their size, indicating particularly juicy fruit.Pomegranates should have soft, leathery skin; avoid fruit with shriveled skin. Store pomegranates at room temperature for up to 3 weeks or refrigerate for up to 2 months.Pomegranate seeds and juice can be frozen for up to 6 months. 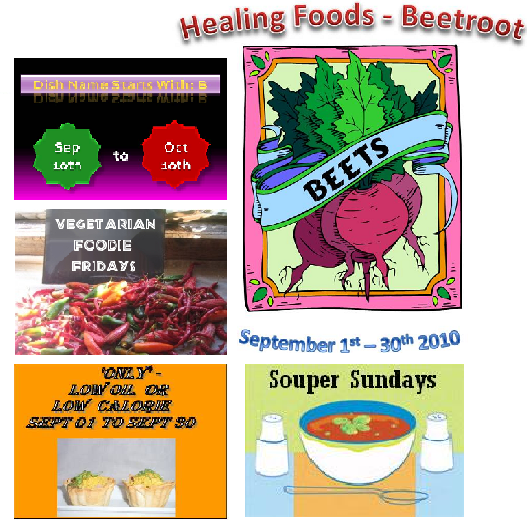 This is my submission to this week’s Souper Sundays, hosted by Deb from Kahakai Kitchen and My Legume Love Affair, hosted by Susan from The Well-Seasoned Cook. 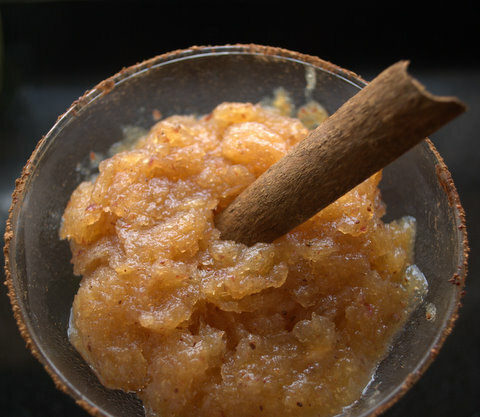 We are just out of monsoons and what better way to enjoy the frozen dessert in the coming season of heat and humidity. Slice apples into thin slices, leaving skin on.Blend the apple in a liquidiser to get a smooth purée. Make a simple syrup with sugar and water, bringing liquid to a boil.It should have a thin syrup like consistency.Let the syrup cool. 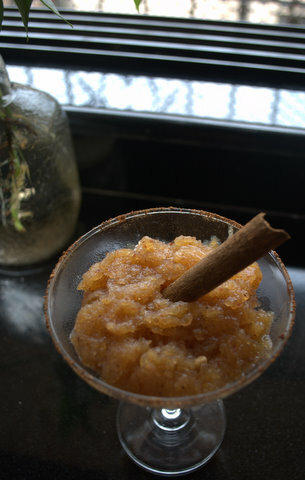 Combine the syrup with purée,lemon juice and cinnamon.Freeze overnight or till it is set . Spoon it into martini glasses and serve immediately (serves four). This is my submission to this month’s SOS Kitchen Challenge, hosted by Ricki of Diet, Dessert and Dogs and Kim of Affairs of Living.The SOS challenge invites blogger/non blogger to create new recipes based on one key ingredient and should be vegan, no refined sugars, and natural, whole foods ingredients only.